Wired M2000-3-50CSLC or Wireless HH2400-3-50CSLC are $9995.00 Using our wireless hand held indicator. 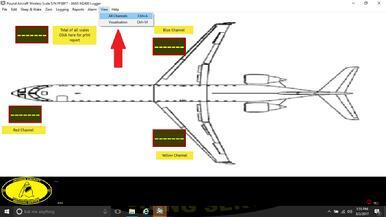 Gulfstream GIII, GIV, GV, G650 all corporate Gulfstreams can be weighed on your -50CSLC kits, wired and wireless! Global Jets are easy to weight with our large format cells. Our kits are top of jack mount and use the one inch hole in the top of your jack ram. Locate the cup on your jack and remove it, check for the 1 inch hole mounting for load cells, if you do not have the hole, no problem, we have jack adapters to fit most jack types. We also offer our wireless in our M2400 laptop series at the same price of $9995.00 Laptop reads out as your indication showing all channels as well as MAP Visual modes, and can print your reports using your own standard printer! 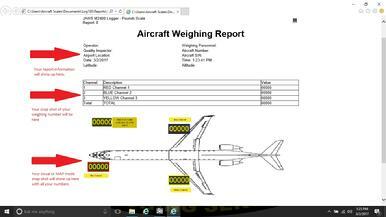 Here is a CRJ printed report page, you can see the information displayed, scale readings displayed and the MAP Visual mode displayed, all printed out for your records. Here you can see our MAP Visual page read out. Many customers prefer to use this display during weighing.